Three miles in length and 1¼ miles at its widest point, Manitou Island sits approximately 2¾ miles to the east of Keweenaw Point at the northern end of the Keweenaw Peninsula. Serving as the marker for an important turning point for both up and down-bound vessels, as well as those making south toward Marquette and Houghton, rocky shoals extended from the island's shores in all directions, representing a significant threat to any captain passing too close to the island during periods of limited visibility. With construction of the new lock at the Soo planned for completion in 1855, a major boom in maritime commerce on Lake Superior was both expected and eagerly anticipated, and a light on Manitou thus became of critical importance to mariners. To this end the first station on Manitou Island was built at the eastern end of the island in 1849 at a cost of $7,500. While no known images of this station exist, we do know that it consisted of a 60 foot tall rubble-stone tower outfitted with a Lewis Lamp array at a focal plane of 71 feet. Angus M Smith received the appointment as the stations first keeper, and moved into the simple attached rubble stone dwelling on September 5, 1849, exhibiting the light for the first time soon thereafter. On July 29 of the following year, Henry B. Miller, the district Superintendent of Lights, accompanied the contractor to inspect the new station, reporting that "Everything here is in good order. The tower is, in my opinion, a good one, and is all complete, with the exception of the spindle or lamp frame in the tower, which is missing." The contractor pledged to install the missing frame, and Miller signed-off on the project as complete and satisfactory. While rapid deterioration of the structure over the ensuing ten years indicates that Miller likely overlooked some serious construction flaws, he was evidently aware of the isolated existence keeper Smith was forced to endure, since in his report for that year Miller recommended that the pay for a couple of keepers at less isolated stations in the district be reduced, in order to allow a fifty dollar increase in Smith's annual pay rate. At the dawning of the decade, the maritime community rose in anger at the dismally poor administration of the nation's aids to navigation by the Fifth Auditor of the Treasury. Congress reacted in 1852 by forming the Lighthouse Board, to which it simultaneously transferred responsibility for the management of all lighthouses. Made up of individuals with maritime and engineering experience, one of the Board's first priorities was to undertake a system-wide upgrading of illumination technology, switching over from the universally adopted Lewis Lamp to the vastly superior French Fresnel lenses. 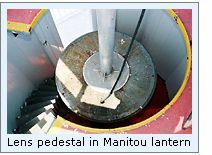 To this end, a work crew arrived at Manitou in 1856 to supervise the replacement of the station's birdcage lantern with a modern octagonal structure of cast iron, into which the District Lampist carefully installed a flashing white Fourth Order Fresnel lens, thereby increasing the station's visibility range to 14 miles in clear weather. In 1855, Smith identified an additional method through which he was able to increase his income, by having his wife Lydia appointed as the station's assistant, a tactic repeated by three following keepers! By 1859 the condition of the Manitou Island station had deteriorated so far as to prompt Michigan Senator Zachariah Chandler to raise the urgent need for repairs or replacement in the Senate on February 10. In order to obtain a better understanding of the issue, the matter was forwarded to the Department on Commerce with instructions to investigate and to return with a recommended course of action. Evidently the investigation proved positive, since the necessary appropriation was made, and the Eleventh District Engineer drew up plans for the construction of three virtually identical structures at Manitou, Whitefish Point and Detour. Contracts for the iron work and building materials for the new station were awarded in 1861, and a work crew dispatched to the island with the materials that summer. The tower was built of prefabricated numbered cast iron sections which were assembled in a manner similar to that of a giant erector set. The tower featured a six-foot diameter cylindrical cast iron center cylinder of ¼ inch plates, with its interior wall lined with wood paneling to help reduce condensation. Within this cylinder, a series of cast iron stairs spiraled from the entry at the lower end to the lantern, which was also fabricated of cast iron sections. The center cylinder and lantern were supported by four tubular iron legs which were bolted to concrete foundation pads. The four legs were in turn supported by horizontal cross members with the entire assembly provided rigidity by way of diagonal iron braces equipped with turnbuckles. 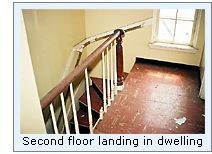 Interestingly, the central cylinder did not reach the ground, but was suspended approximately 17 feet above ground level, with entrance gained from the second floor of the two story wood frame dwelling through an elevated covered passageway. Construction of the new station continued through the arrival of winter in 1861, and then resumed with the opening of the navigation. 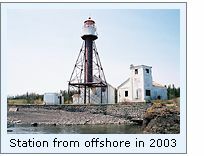 On the station's completion in 1862, the importance the Lighthouse Board placed on the station was witnessed by the fact that the new lantern was outfitted with a large Third Order Fresnel lens manufactured by Henry-Lepaute, an order of which only nineteen would ever be displayed in all of the western Great Lakes lights. The lens featured six bulls-eye flash panels, which when rotated around the lamp would provide the station's designated characteristic of a solid white light punctuated by intense white flashes once every minute. With the station's completion, the old tower and dwelling were in such poor condition that they were razed, being considered as unfit for modification for alternate use. With the exception of the arrival of a work crew to repair a crack in the iron band at the base of the main tower cylinder and to repaint the entire station two years previous, life on Manitou in 1870 was largely one of quiet isolation for Keeper Charles Corgan and his brother Henry, who was serving as his assistant, and it is quite likely that they were oblivious to plans being discussed in Detroit and Washington that would forever change the sanctity of their remote island station For it was in 1870 that the Lighthouse Board recommended to Congress that funds be appropriated for the establishment of a fog signal on the island to help guide mariners making the turn in the pea soup fogs which frequently blanketed the area. Congress responded quickly, appropriating $5,000 for the fog signal's construction on March 3, 1871. A pair of wood frame fog signal buildings were erected on each side of the tower in 1875, with their interior walls lined with sheet iron for fire protection, and on completion, each building was outfitted with its own steam engine supplying steam to a 10-inch locomotive whistles. According to Lighthouse Board policy, station log books were supposed to contain concise single-line entries reporting the weather conditions and notable happenings at the station, with "no personal opinions or remarks on family affairs or ordinary household work." However, James Corgan, who served as Keeper of the Manitou Light from October 22, 1873 through July 29, 1875 was a strong-willed individual, who took great pride in his abilities and intelligence. Not one to suffer bureaucratic nonsense well, Corgan was surprisingly forthright in his log entries. On August 5, 1875, Corgan visited L'Anse, where he learned of the Board's impending decision to remove him from his position. Click here to view excerpts of the Manitou station log book. 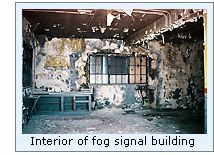 Over the ensuing years, the Manitou fog signals proved to be one of the most active in the district, and by the late 1880's it was determined that the apparatus in both buildings had outlived their useful lives. The lighthouse tender AMARANTH arrived at the station with a work party and the necessary supplies for construction in late May of 1899. The north fog signal building was extended 12 feet to an overall length of 42 feet in order to make room for both sets of apparatus, and a new concrete floor poured throughout. After removal of the worn out apparatus, the new machinery was installed and tested. With the construction of a 12 foot by 17 foot coal bin, construction was completed on July 3, and the AMARANTH returned to remove the work party to transport them to their next work assignment. It would appear that there were some significant personnel problems encountered at the station in 1881, since Keeper Henry Guilbault and his 2nd assistant Richard Rickard were both simultaneously removed from their positions on October 22, 1881, leaving Guibault's brother Norman, the station's 1st Assistant temporarily in charge. Reuben Hart, who had been serving at Huron Island for the past two years was promoted as Acting Keeper of the Manitou Light. On Hart's arrival at Manitou on October 26, Guilbault was simultaneously transferred to Huron Island to fill the opening left by Hart's promotion. Hart appears to have manned the station single-handedly through the end of the 1881 navigation season. On March 29, 1882, Henry Ferguson and John Gustafson arrived on Manitou, freshly hired to fill the positions of 1st and 2nd Assistant Keepers, respectively. Evidently neither Ferguson nor Gustafson were cut from the right cloth for lighthouse service, and hiring the two men proved to be a mortal error for Hart. A scant few months later, the two men would stand by as they watched Hart's boat overturn a few feet off the island with neither of them lifting a finger to render assistance. In a strange twist of fate, James Corgan who had been re-hired into lighthouse service as keeper of the Gull Rock Light was the first outsider to come to Manitou after the incident and helped search for the body. Instructed to temporarily assume responsibility for Manitou until a new Keeper could be assigned, Corgan recounted the story in detail in the Manitou log book. Click here to read Corgan's full account directly from the Manitou log. As part of a system-wide upgrade, a brick oil storage house was built in 1895, and the fog signal apparatus was thoroughly overhauled. Two years later, a sixty foot long dock was constructed of huge timber cribs filled with stone. Amazingly, these massive cribs were pulverized during a violent gale in October 1898, and a work crew was dispatched to the island to undertake temporary repairs late that season. While on site, the crew also began blasting the rocky shore to prepare for the construction of a boat house and boat ways. While the tender AMARANTH delivered a hoisting engine for the station and materials for the construction of more permanent cribs and a derrick in 1900, it was not until 1901, that a work crew was placed on the island to complete construction of the boathouse, boat ways, dock and derrick, and to repaint the tower, changing its color from brown to white. 1907 saw the installation of 80 concrete sidewalk slabs which had been pre-cast at the Detroit depot and the installation of a steel water supply tank for the fog signals. This was also a memorable year for the Manitou Keepers, as they hauled and shoveled 40 tons of coal during the season to keep the fog signals screaming for a station-high 627 hours. With the growing maritime adoption of radio technology, a radio beacon was installed at the station on October 23, 1925. Emitting a repeated characteristic of sixty-second blasts of three Morse Code dashes followed by a ninety second silence, the beacon was activated during periods of thick weather and for a half hour each morning and afternoon for testing purposes. 1928 saw the electrification of the Light and dwelling through the installation of diesel powered generator and battery system. Under the Works Project Administration, the fog signal was completely rebuilt in 1930, and the steam whistles replaced by a pair of compressor-powered Type F diaphones. Also around this time, an underwater telephone line was laid from Keweenaw Point to the station, truly bringing the twentieth century to the island. Today, Manitou station still serves as a guide to mariners, it's light currently provided by a 12-volt solar powered 190 mm acrylic, displayed from the same position in the lantern from which the mighty Third Order Fresnel once stood. As of this date, we have been unable to identify the disposition of the Fresnel, and would appreciate hearing from anyone who might know of its whereabouts that at least in the words on this page we might reunite it with its station. 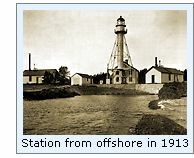 Click here to see a complete listing of all Manitou Island Light keepers compiled by Phyllis L. Tag of Great Lakes Lighthouse Research. We have yet to visit this light, but will update with our observations as soon as we arrange to make landfall on the island. Keweenaw Excursions offers various lighthouse cruises on board the KEWEENAW STAR out of Houghton, Michigan. A number of these tours include close passes by the Gull Rock Light. For more information on any of their tours visit their website, or telephone Keweenaw Excursions at (906) 482-0884. Annual reports of the Lighthouse Board, various, 1853 through 1909. Annual reports of the Lighthouse Service, various, 1910 through 1939. Great Lakes Light Lists, 1861. 1872. 1901, 1928, 1939. US Lake Survey Great Lakes Pilot, 1958.